The Cathedral Clock is now operated using electricity, rather than a clockwork mechanism. The motor is a car windscreen wiper motor. There are back-up batteries in the event of a power failure. 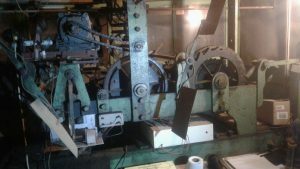 The original clock mechanism, now no longer working. It was wound up every three days, from the bell ringing chamber below the bells. To access the mechanism, one climbs the stairs up to the bell ringing chamber, then up a ladder to the bell chamber, from there climb round and over the bells to another two ladders up to the next level. This is at the height of the clock face. There are another two levels, but those ladders have been removed. 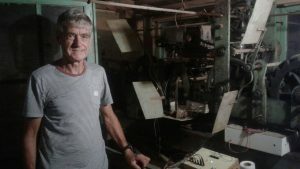 Professor Richard Grant has maintained the clock mechanism for some 30 years, apart from the years when Wayne Jayes and his son Jonathan were involved, and more recently Prof Ian Meiklejohn. Richard, Wayne and Ian have all brought innovations to the working of the clock. Before 1873, time in Grahamstown was set by the firing of a signal gun from Fort Selwyn. “By 1873 money had been raised for a public standard of time so that the gun could be done away with. A clock was purchased from Thwaites and Reed of London and shipped in April 1873. It was landed at Port Alfred and brought to Grahamstown by ox-wagon in 9 packing cases. “The clock was erected in the old tower of the cathedral by Henry Galpin, a watchmaker and jeweller who worked in Grahamstown from 1850 to 1886 and it was chiming the hours and quarter hours by the end of 1873. A third bell had to be added to the two already present in the tower in order to obtain the three notes necessary. “The clock was taken down in 1874 when the old tower was demolished, and installed in its present site during 1879 by Henry Galpin and his assistant John Wilcox. Apparently Galpin, who was 59 by this time, did not like the long ladders in the new tower. The metal from the old bells had been included in the present set of 8. “The clock has run more or less continuously since then but with decreasing reliability and there is a record of a complaint by the Dean in 1938 that the clock was often wrong and the townspeople were unsure whether to go by the time they could see or the time given on the radio. Apparently the confusion was causing people to arrive late for services! 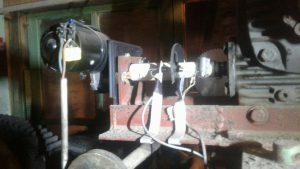 “In 1984 I installed a crystal controlled solenoid which replaced the pendulum. This solenoid in turn controlled the escapement mechanism and made the clock as accurate as a digital watch. The clockwork still had to be wound however and an attempt to restore the chimes failed because the gears and cams had become too worn. Chiming was erratic and residents complained about the noise going on throughout the night.